Are you sitting down. If not, you need to. Because what I’m about to tell you is shocking and (yes, I’m not afraid to admit it) deeply disturbing. I don’t know if you’ve noticed, or maybe heard on the news, that some of our American values may be slipping. That we as a country might not be as great as we once were. 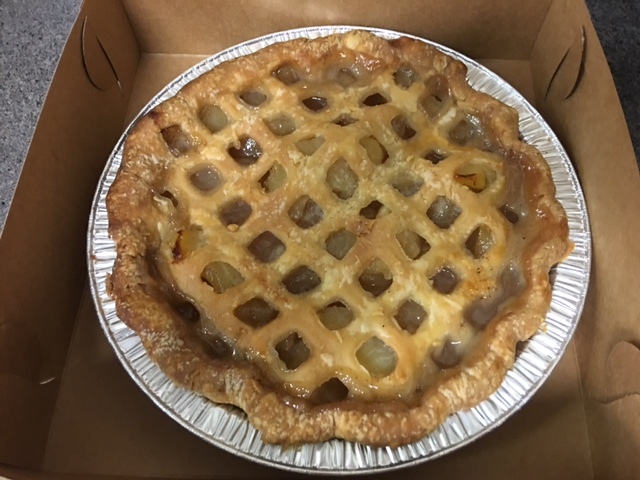 The apple pie I bought for Sunday school . . . IF it survives a Saturday alone with me. Well, here’s the shocking part: I have traced the problem to it’s root. It all happened innocently enough – (cue ominous, shocking music) in Sunday School! I help teach a class of first and second graders. And on this particular Sunday we were having a discussion before a discussion. In other words, I was chatting with the kids before the lesson began. And so I had asked them what their favorite fruit was. Most said apples. Some said bananas. One said oranges. Another really like strawberries. Then one of the kids said she liked green apples. To which I said, those are great for making an apple pie. Blank looks all around. I expected to hear crickets chirping at any moment. But there it was, the mention of apple pie and Not One of the Children Knew What I Was Talking About. “You know, Appppppppple. Piiiiiiiiiiieeeeee”. I pronounced it very slowly as if they had suddenly lost their ability to comprehend the English language. They just looked from one to the other, thinking, I’m sure, what have we done wrong. Or, maybe more probably, what the heck is wrong with this guy?! But by this time, I didn’t care. I’m not completely sure, but I may have started to hyperventilate as I began to realize that our country was much closer to teetering over than I had ever thought possible. Not. One. Hand. Was. Raised. And so, after more discussion they decided that they too would like to do their civic duty for the good of the ole US of A and try some apple pie. So that’s what I’m going to do. This Sunday, I’m going to make an apple pie and take it to church. Wait. That’s not quite right. I’m going to make an apple pie APPEAR and take it to church this Sunday. I’ve already ordered and picked up the pie. And we’ll see if I can right this ship and get our country sailing back in the right direction, even if it’s only a few young’uns at a time. That is, I’ll do that unless I get a hankering for some pie this weekend myself. After all, if nothing else, I’m VERY patriotic. What about McDonald’s apple pies? Have they not tried those?! Maybe it was just a fluke or Sheltered kids, like the kids who aren’t sugar or gluten. Either way, good for you on initiating with pie.